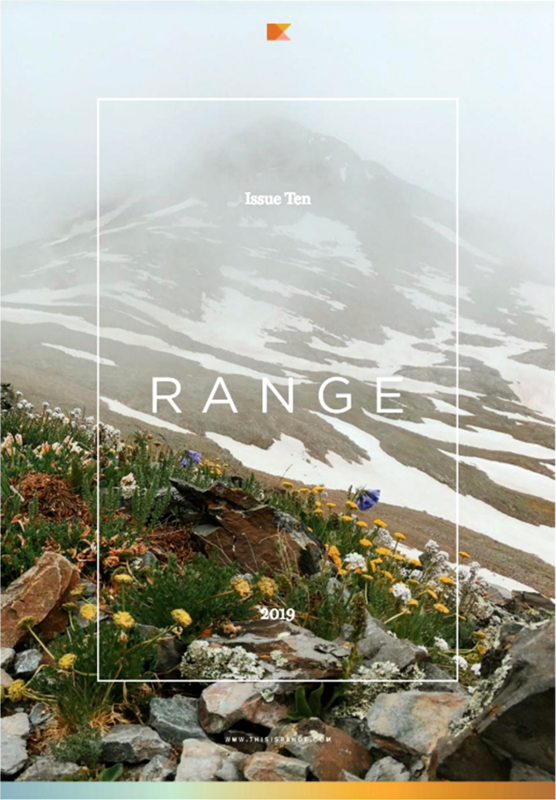 A feature for Range Magazine’s Issue 10, dedicated to progression. This article was written for, curated and published by RANGE MAGAZINE in February 2019. 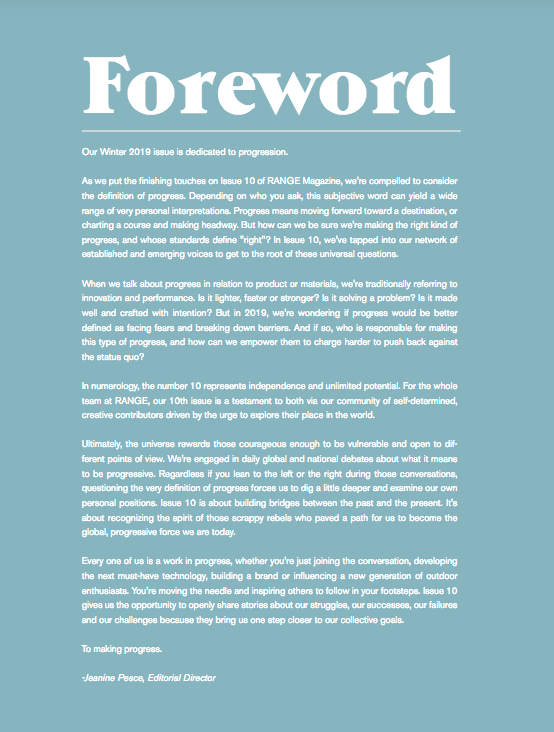 Below is the full submission text. See full publication HERE. The landscapes of planet Earth are in a perpetual state of flux, as they always have and always will be. For billions of years, the agents that dictated this flux were solely inorganic: the shift of tectonic plates, physical forces such as gravity and magnetism, bombardment by rogue asteroids. But about 4 billion years ago, microbial life appeared on the scene. A billion years after that, photosynthesizing organisms began changing the chemical composition of the atmosphere, enabling life to emerge from the oceans and evolve into some of the complex beings that exist today. Lifeforms have influenced their surroundings since their origin, but in the age of the Anthropocene there’s a new sheriff in town: mankind. I explore the frontiers of the Anthropocene through my work. As Earth’s terrains progress towards a new state of equilibrium under the rule of this rebellious sheriff, I aspire to capture snapshots of their progression. Where they are going, we do not know. But we do know that today, urban areas cover 3% of the Earth’s land surface. We know that our atmosphere contains significantly more carbon dioxide than it did at the beginning of the Industrial Revolution. We know that from space, it wasn’t long ago that the dark side of the planet was the same shade of ebony as the dark side of the moon, while today it’s lit up like a Christmas Tree as the glow of our electric lights beam out into the cosmos. Each landscape I produce contains references to what makes that region vulnerable. Vulnerabilities present opportunities for greater rates of change away from a baseline state, as weaknesses in environmental stability give way to shifts in that ecosystem’s equilibrium. I don’t condemn progress. On the contrary - I imagine progressing towards a higher state of being for humans. One in which we actively improve instead of degrade the world around us, both socially and environmentally. But today, it seems that humanity is largely in denial of how significant our compromising effect on planetary stability is. Perhaps if we take more time to inspect our impact, we will remember what is at stake. Whether through the contemplation of art or via other means, I suspect the more time we spend daydreaming about a reckoning of man and nature, the greater the possibility that we will begin to be more deliberate about what our existence means for the progression of Earth’s landscapes - and our place among them. Mountainsides // The Sierra Nevada mountains are at once majestically isolated, and teeming with evidence of humanity. Where I grew up in the northern range, rural communities dot the foothills. Along with them come ageing infrastructure: archaic buildings, abandoned electrical lines. The structural geometry in this piece represents the way that these structures interplay with routes up to untamed peaks. Cradle // The Rocky Mountains, Colorado’s wildest natural spectacle, are named such as indigenous populations noted that "When seen from across the prairies, they looked like a rocky mass". While Colorado also boasts one of the fastest growing population rates in the country, the streams of people escaping into these stunning terrains for weekend recreation or real estate opportunities thicken along with it. This piece contrasts organic, natural landscape elements with the stark, rigid structures that human development inevitably delivers to the countryside. Homestead // Alaska has the smallest population density of any US state. But those who do live there get to experience landscapes quite unlike anything else in the country. 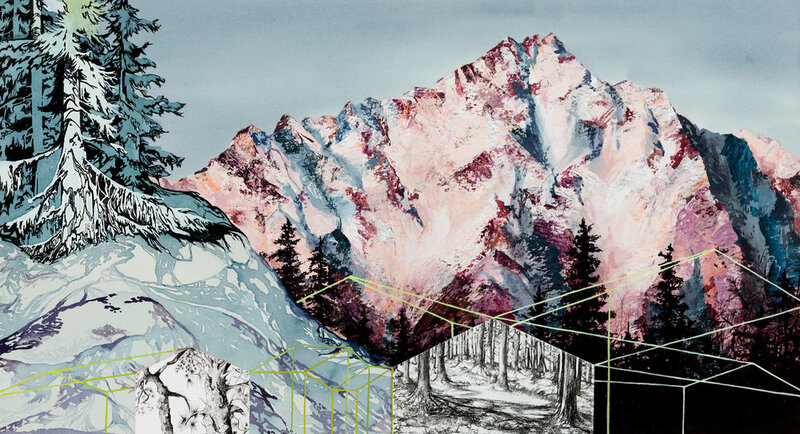 “Homestead” portrays an abstract rendition of a human dwelling nestled within pine forests below Pioneer Peak, an archetypal Alaskan summit. Zenith // Dillon Reservoir of Colorado’s Summit County has a tale not dissimilar from many water bodies near populated mountainous regions of the US. With a rich mining history, acid mine drainage (AMD) has long compromised the health of waters downstream from mines. AMD occurs when mining exposes rocky surfaces that contain an abundance of sulfide minerals, or liquid draining from coal stocks makes travels into waterways. Both activities change the chemistry of the water, often turning it orange - symbolized by the vertical orange stripes running through “Zenith”. Archipelago // Deep in the northern Atlantic Ocean, the Faroe Islands jut out of the icy waters like the fins of a shark. Like many islanders, the human inhabitants face resource constraints. The most palpable? Space itself. The cliffs continuously erode as waves, tourist foot traffic, and coastal development bear down on them. 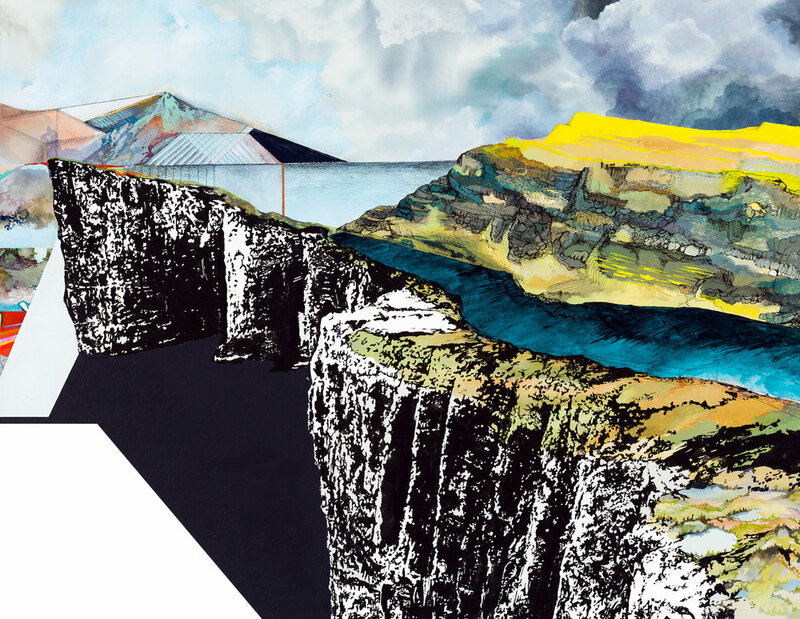 The sheer cliffs central to this piece are depicted in black and white to express the distillation of their value to modern humans – they have progressed from being dynamic, geological entities, to precious commodities. Bridle // Waters of the American West travel far on their paths from snowy peaks to desert canyons. During the 20th century, pressure from growing Western metropolises raised thousands of dams and reservoirs to delay the passage of these waters for agriculture, hydropower generation, and urban consumption. The abstract dam depicted in this piece explores how landscapes on-site, and downstream from such entities evolve drastically to accommodate new paths of flow, alterations in animal passage, and redistribution of sediment and nutrients. Fjöll // Iceland. A treasure trove of chartreuses and shale palettes, expansive glacial outcroppings, and breathtaking mesas. The Iceland of the Anthropocene faces birch forest decline as inhabitants clear them to feed construction needs, glacial recede as climate change warms the air and water that dictate glacial cycles, and a skyline makeover as iconic architectural elements such as the Harpa Concert Hall challenge the bold mountainscapes for most stunning landscape feature.